The 1970s Diet: What's Your Excuse for Not Eating Healthily? What's Your Excuse for Not Eating Healthily? Is a wonderful book I was given recently to review and I'm so glad I came across the author by chance on Twitter. 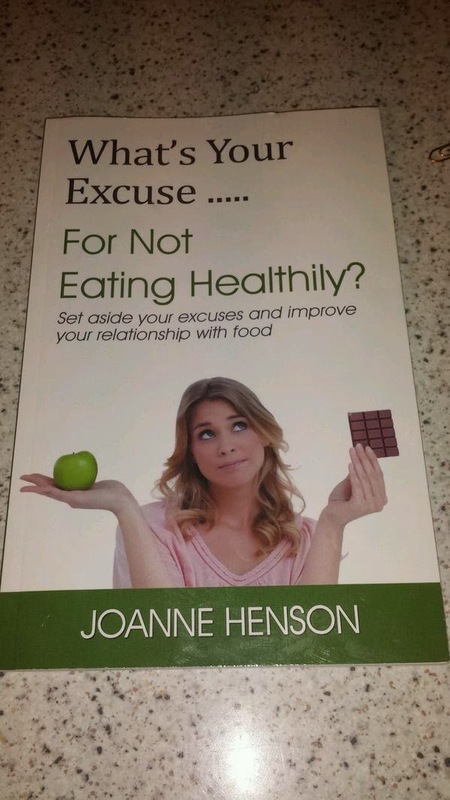 Joanne Henson is a lifestyle coach and has self published her own book on all the excuses that people come up with when it comes to dieting. And what an exhaustive and exhausting list it is too! My goodness, they're all in there. What I love about this book is the matter of fact answer to every single one of them! I will definitely be using it as a reference guide when I start trying to come up with my own excuses. After a while you think if only we put as much effort into eating the right foods than the excuses we manage to muster up - life would be so much simpler. Much of what Joanne writes about I totally agree with and have written about here on my blog. In particular that diet clubs simply do not work. She gives an example of one of her clients who said its the only thing that works! Clearly not. Also Christmas - don't get me started on Christmas. I know of someone that put up their tree on Remembrance Sunday. Could the world get anymore messed up!? In bad taste doesn't even come close. Never mind about remembering the lives that were lost and the impact of the lost generation - lets just buy stuff like Christmas jumpers and put up countdowns on 'how many sleeps' it is till the big day. Urgh why is everyone so infantile? We're not a patch on the fallen generation even my grandparents were far more humble and tasteful when it came to Christmas. Sorry back to the book. Yes, Joanne quite rightly points out that you can buy a Christmas calorie busting coffee at the beginning of November. So Christmas isn't (not for a long time) about Christmas Eve, Christmas Day and Boxing day - the treats start in November. The best line in the book says "you're not a dog!" when it comes to a 'treat'. This really made me laugh and is so true. We don't need food rewards! She talks about people who say they always have a big breakfast on a Saturday etc and makes the point that if you've always done the same thing expect the same results. You have to change the things you've always done as clearly its not working. I also liked how people who say they're a 'chocoholic' wear it like a badge of honor - something to be proud of but would it sound quite as amusing if they said "I eat too much chocolate"? I would probably add "and that's why I'm fat". The only part I felt was a bit lenient was the temptation - removing all temptation. She talked of her husband changing his favorite biscuit to one that she didn't like thus removing the temptation. I would take a hard line approach on that - others shouldn't have to change what they eat just because it might tempt me. This is where my chimp book comes in handy - the chimp wants instant gratification and if you can remember that then you can just not eat things that others are merrily chomping away on. I will certainly be using this as a reference book and keeping it handy at all times. I enjoyed it immensely and was very excited that someone was talking my language. I would highly recommend it if you struggle to eat well for a sustained period. I guarantee you will be nodding in agreement whilst turning the pages. So it you want a 'treat' this Christmas I would highly recommend this book. I asked for a free copy of this book to review on my blog. I did not receive payment and the views expressed are my own and are always honest. Labels: diet excuses, joanne henson, lifestyle coach, what's your excuse for not eating healthily? What's Your Excuse for Not Getting Fit? All The Pretty Things....And Not So Pretty..